Without the sacrifice and fighting spirit of thousands of working class women, the struggle against the Lockout could not have been sustained. Their role was critical in the movement. Their contribution and this proud legacy deserve special mention. In Ireland, in the early decades of the 2oth century, women were fighting to improve their situation on several fronts. Women workers began to organise to take on their employers, and sometimes male workers and trade unionists, in their attempt to lift themselves from the bottom of the social morass that existed in cities like the Dublin of that time. In parallel to that movement, many women were fighting to achieve the basic right to vote. The more militant and class conscious of the suffragists energetically supported the labour movement activists in the epic battle of the Dublin Lockout. Women played key roles during the months of the Lockout, at every level of the struggle. Women struck, fought on the streets, went to jail and provided sustenance for strikers and their families. Women were to the forefront in the battles with the police and in looking after the welfare of the children and families of the strikers. Initially the IWWU functioned as a semi-autonomous section of the ITGWU. It is suggested by some that Larkin may have supported the creation of the IWWU to offset opposition of more conservative male trade unionists, even within the ITGWU itself.101 There is still debate as to the reason for this degree of separation. William O’Brien claimed much later, in a letter in 1955 that was hostile to Larkin, that Larkin initially interpreted “persons” in rule 5 of the ITGWU as a “male only membership”. Desperate social conditions forced many women into prostitution, which was a much larger problem in Dublin than any other city in Ireland or Britain. At the turn of the century, the Dublin Metropolitan Police estimated that there were 1,677 women working as prostitutes, representing 2 per cent of the city’s female population as a whole and a much larger percentage of the adult women living in the tenements. 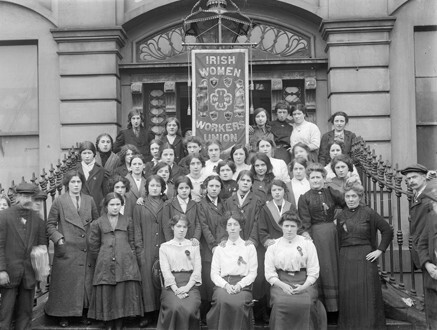 When the IWWU was set up in 1911, the Irish Worker reported that “women workers in their thousands” turned up to launch the union at a meeting in the Antient Concert Rooms on Tuesday, 5 September. The Dublin Evening Mail recorded the capacity of the hall, (which is now known as the Academy and is in present day Pearse St), as “between 900 to 1000 persons” at its opening in 1842.107 James Larkin, who became president of the union, Constance Markiewicz, James Nolan and Hannah Sheehy-Skeffington were the main speakers and Delia Larkin, who was to play a key role in the IWWU and during the Lockout itself, was present. George Jacob was a Quaker and, similar to other employers who were part of that religious group such as Cadbury and Rowntree in England, they regarded themselves as “model employers” with “model factories”. Despite their highly righteous self image, these employers were amongst the most strident opponents of the ‘Factories Acts’ in the nineteenth century, which sought to bring in minimum standards and work conditions. This was no false rhetoric, the majority of women workers were paid scandalously low wages, between 2 Shillings 6 Pence and 6 Shillings (13c and 32c) for a full week’s work. Sackmakers in Keoghs, with over 12 years service, were paid 6 Shillings a week. A short strike in Keoghs in May 1912 led to a pay rise. Despite the pittance they were paying, some companies tried to cut wages further. According to Helena Molony, political activist, feminist and Abbey actor, the employers began a major campaign of intimidation to reduce even these low wages and attempted to force women to sign a commitment to stay away from Liberty Hall and the IWWU or else face dismissal.114 Strikes and disputes ensued in the Savoy Café, Pembroke Laundry and Maguire and Patterson. “In Ireland the women’s cause is felt by all labour men and women as their cause … the labour cause has no more earnest and whole-hearted supporters than the militant women”. When the Lockout began, women were very quickly involved in the affray. On Saturday 30 August, five days into the dispute, serious rioting broke out around Dublin city. Beginning initially at a football match in Ringsend between Bohemians and Shelbourne, in which some scabs were allegedly playing, fighting continued all the way up Brunswick Street into the city centre. A clerical colleague of Archbishop Walsh, Father Curran, witnessed some of the events. His description of some of the events is illuminating, both of his personal attitudes and of the role played by women and youth. During 1913, 50 women were charged with assaulting a constable, 15 women were arrested in connection with indictable offences and 30 for non-indictable offences in relation to charges of intimidation. Two women were charged with indictable rioting offences. One of the tenants from Foley Street, Mary Ashbourne, was fined £2 or given the option of a month in prison. Jacob reacted by closing the factory for two weeks, reopening it on 15 September insisting that no members of the ITGWU would be re-employed. On 15 October, six weeks into the strike, the company records show that 645 of the original female workforce had not returned to work, despite the company’s ultimatum that they would be sacked. As yet, very little detailed historical follow-up seems to have been done on the working class women strikers of the Lockout. The women that stayed out were amongst the most vociferous of the strikers, ever present at demonstrations, pickets and involved in much anti-scab activity. Of these, Rosie Hackett was the most well known. Delia Larkin put in enormous efforts to find alternative employment, setting up the IWWU Dramatic Society initially, but attempting then to build the Irish Women Workers Co-operative Society which struggled to survive in the gloomy aftermath of the dispute. James Connolly, along with Helena Molony, Rosie Hackett and Jennie Shanahan continued to try to provide work in Liberty Hall when Delia Larkin was forced to return to Liverpool. 93 Newsinger, Rebel City: Larkin, Connolly and the Dublin Labour Movement, p. 105. 94 Workers’ Republic, 29 May 1915. 95 Arnold Wright, Disturbed Dublin: The Story of the Great Strike of 1913-14 (London, 1914), p. 29. 96 Marget Ward, ‘Suffrage first, above all else – An account of the Irish Suffrage Movement’, Feminist Review, No. 10 (Spring, 1982), pp 21-36. 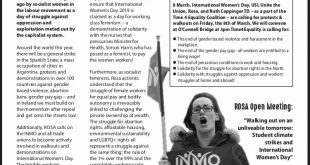 97 Mary Jones, These Obstreperous Lassies, A History of the Irish Women Workers Union (Dublin, 1988), p. 3. 98 Alison Buckley, ‘ ’Let the Girls Come Forth’: The Early feminist Ideology of the Irish Women Workers’ Union’ in A. Hayes and D. Uruqhart (eds), Irish Women’s History (Dublin, 2004), p. 105. 99 R. C. Owens, A social history of women in Ireland 1870-1970 (Dublin, 2005), p. 194. 101 Jones, These Obstreperous Lassies, A History of the Irish Women Workers Union, p. 4. 102 Ward, ‘Suffrage first, above all else – An account of the Irish Suffrage Movement’, pp 21-36. 103 Owens, A social history of women in Ireland 1870-1970, pp 196-7. 104 Theresa Moriarty, ‘Larkin and the Women’s Movement’ in Nevin, James Larkin, Lion of the Fold, p. 96. ; Jones, These Obstreperous Lassies, A History of the Irish Women Workers Union, p. 2. 105 Patricia McCaffrey, ‘Jacob’s Women Workers during the 1913 Lockout’, Saothar, vol. 16 (1991), pp 118-129. 106 Yeates, Lockout, Dublin 1913, pp 53-4. 107 Patrick J. Stephenson, ‘The Antient Concert Rooms’, Dublin Historical Record, vol. 5, no. 1 (1942), p. 7. 108 Jones, These Obstreperous Lassies, A History of the Irish Women Workers Union, p. 2. 109 Buckley, ‘ ’Let the Girls Come Forth’: The Early feminist Ideology of the Irish Women Workers’ Union’, p. 104. 110 McCaffery, ‘Jacob’s Women Workers during the 1913 Lockout’, pp 118-129. 111 Michael Rowlinson, ‘Quaker Employers’, Historical Studies in Industrial Relations, no. 6 (1998), pp 163-98. 112 Newsinger, Rebel City: Larkin, Connolly and the Dublin Labour Movement, p. 27. 113 Jones, These Obstreperous Lassies, A History of the Irish Women Workers Union, pp 5-6. 115 Nevin, James Larkin, Lion of the Fold, p. 94. 116 Yeates, Lockout, Dublin 1913, p. 50. 119 Peter Murry, ‘A Militant Among The Magdalens? Mary Ellen Murphy’s Incarceration in High Park Convent During the 1913 Lockout’, Saothar, vol. 20 (1995), p. 41. 120 Yeates, Lockout, Dublin 1913, p. 412. 122 ‘Freedom’s Martyrs Project’, (http://womenworkersunion.ie/?page_id=231). 123 McCaffrey, ‘Jacob’s women workers during the 1913 Lockout’, pp 122-3. 124 F. Devine and M. O’Riordan, James Connolly, Liberty Hall and the Easter Rising (Dublin, 2006), pp 75-83. 125 R. C. Owens, ‘Louie Bennett’ in M Cullen and M. Luddy (eds), Female Activists: Irish Women and Change, 1900-1960 (Dublin, 2001), p. 44. 126 Nevin, James Larkin, Lion of the Fold, p. 98. 128 Irish Times, 5 January 1914. 129 Nevin, James Larkin, Lion of the Fold, p.101.